According to some reports, the first Englishman to have visited India was a Father Thomas Stephens, who arrived in Goa in 1579. Cut to 1681, when the East India Company agreed to support four scholars annually at the University of Oxford. The first Indian students to take degrees at the university came up in 1871. Today, there are over 160, with 670 alumni resident in India. 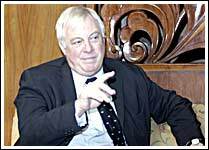 All of these facts and figures come into play when finds oneself in conversation with Lord Chris Patten, Chancellor of the University of Oxford, currently here to strengthen the United Kingdom-India education relationship. It doesn't seem like a hard task, considering this is a university that has given the world six kings, 46 Nobel Laureates, 25 British prime ministers, three saints and 86 archbishops. And yet, there aren't as many Indian students going to Oxford as the university would like. It is a rather unusual role for Patten, one he has held since 2003. But, like everything in his past, he appears to have adapted admirably. He turns 62 this year, and the last 15 years have seen him move from prominent Conservative politician to his most famous post -� that of last British governor of Hong Kong. 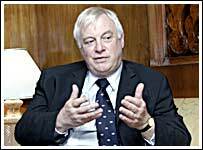 From 1998 to 1999, Patten chaired the Independent Commission on Policing for Northern Ireland, better known as the Patten Commission. 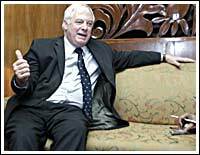 He was then European Commissioner for foreign relations, returning to Britain to be raised to the peerage. Hong Kong was handed over to the People's Republic of China on June 30, 1997. At the centre of that media frenzy was Patten, who handled what was a tough job extremely well. These days, he is better known in India as the father of Alice Patten, who played a lead role in the film Rang De Basanti. You are apparently the first and only British governor to have a Chinese nickname -- Pang Ting Hong. What does it mean? It isn't the only nickname they gave me. Pang is the nearest to Patten, while Ting Hong means 'health and prosperity'. Fei Pang is another -- it essentially means Fatty Patten, which is more true today than when I was governor. But it meant to be affectionate, because being round in China is regarded as a mark of prosperity and health. Even when I went to see Chinese leaders like Jiang Zemin or Hu Jintao, they would call me Pang Ting Hong, not Patten. In your book (Not Quite the Diplomat), you talk about how 'pressing the flesh' was uplifting. Do you still feel that way, considering you've been doing it for years? I am an ex-politician now, really. And I miss it. I like interacting with the crowd. I still get some of it working with students at Oxford or elsewhere, but when I was back in Hong Kong in November on a book tour, it was described by one magazine as 'the return of an ageing rock star' (smiles). How do you propose to promote interaction between Oxford and Indian institutes? I Am talking, first of all, at a macro level. We will certainly be following up my visit both by senior staff of the university and individual professors and department heads. I am also very keen that we should get some of our students to come to India periodically to tell students here what Oxford is like. What I have been saying is that the real purpose we have is to focus more attention on India, and I am particularly keen to establish in our business school a centre for the study of Indian business. Secondly, we do want to promote more collaboration with Indian institutions. We do a huge amount at the moment in the field of health -- on cancer, infectious diseases, chemistry -- but there's much more we could and want to do. I also want us to attract more Indian students. I have said before, that it is counterintuitive that we have 540 Chinese students and 200 Indian students. When you think that it is more difficult for Chinese students to come to Oxford because they have to learn the language first, we have to ask ourselves why we have been doing much less well with Indians. What worries me is that we are plainly allowing a lot of very talented young Indian women and men to slip through our net and swim off to America or Australia. As we are one of the top universities in the world, it helps, in order to stay at the top, to be seen to recruit the best. So, we are obviously worried about why we are not doing that in India. As for collaboration, there is no short-list. India has some outstanding universities. The (Indian) Institutes of Technology, for instance, are now world-renowned. Why do you think the situation is as it is, with that disproportionate ratio? We think we haven't tried as hard as we should have done. I think we have allowed our grand image to get in the way. Everybody has heard of Oxford and it is possibly the best university in the world. There are some wonderful things about its traditions and history. On the other hand, people don't know that we have one of the 20 best business schools in the world, or that we have flexible courses, or that the most popular course we are offering at the moment is in engineering, economics and management. So, we obviously have to correct this slightly shocking image of not just Oxford but other British universities. It is why I am here. It is not a short-term project; it will take some time to turn things around. To be realistic, I think it is going to take 2, 3 years before we start to see any shift in the figures. But the sooner we start, the better. For me as chancellor, India is a big priority. People normally assume it is a lot easier to study in places like the US and Australia for a number of reasons, like funding, for instance. Is there anything you are doing to change that? I was talking to one of your most distinguished business leaders, who said he thought that way too, until he looked at the figures. It is far more expensive to go to a good American university than is it to go to Oxford or a British university. And there may be more scholarships for some post-graduates -- and we have to look at that -- but it is much more expensive to go to an Ivy League university. As for Australia, it is cheaper, but I hope people will have to choose between good universities there and Oxford or Cambridge. How do you intend to change that stuffy image of Oxford you mentioned? By explaining to people what it is actually like. I don't think as a Chancellor I appear to be spectacularly stuffy. And my daughter, who is better known in India than I am, is a pretty good example of what Oxford -- and, in her case, Cambridge -- students are like. Have you seen Rang de Basanti? Did you like it? I have, and I think it is a really good film. It is a very brave film and it shows Indian self-confidence. I was very proud of Alice teaching herself at least rudimentary Hindi to act in it. The Indian stars looked after her like big brothers. You obviously had a lot to deal with as governor of Hong Kong, considering people were enormously suspicious about British political intentions. Have you ever had to deal with that kind of pressure since? Yes, I had a very tough job in 1998-1999 as part of the peace agreement in Northern Ireland. We were organising the police service, which was part of the political problem there. The politicians couldn't deal with the negotiations, so I was asked to chair a commission. But the Patten Report was successful. Yes, it was, but it was a very tough job to actually implement it and produce it. I also had some tough times when I was European Commissioner. Dealing with issues like Iran, the Middle East and the Balkans wasn't straightforward. Dealing with India was easy (smiles). Prime Minister Tony Blair has just announced a new immigration policy. Do you think it will make things simpler for Indian students wanting to study in the UK? I think it will help because it makes clear that there won't be a problem when students come to Britain, get a degree and want to work. The point is to make things cleaner, in a more straightforward way. You once said your greatest success was getting through those five years with Hong Kong's economy in great shape, with its society stable, with its civil society self-confident. Nine years on, what would you say your greatest success is today? I think it is helping people in Hong Kong develop a real sense of citizenship. Hong Kong is not democratic, but it is free and it is liberal. It has a clean civil service, and a professional police force. It has freedom of speech and freedom of press -- a very vigorous, noisy press, which is a sign of freedom. I wanted to apply to oxford, but it has a very early deadline, and I had my Mid term exams at the time.